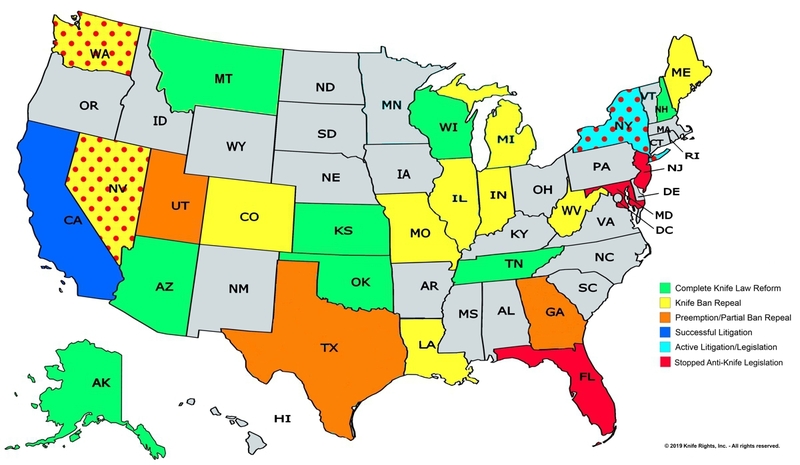 30 PRO-KNIFE BILLS ENACTED IN 21 STATES! Federal Civil Rights Lawsuit filed against New York City & NYC DA over the unconstitutional arrests and prosecutions of over 60,000 carriers of common pocket knives. Knife Owners’ Protection Act Introduced in U.S. House – a Pioneering Knife Rights Effort Protecting Knife Owners Traveling in the U.S. Knife Owners’ Protection Act of 2017 (H.R. 84) including Repeal of the Federal Switchblade Act Introduced in Congress. Knife Owners’ Protection Act of 2017 (H.R. 84) including Repeal of the Federal Switchblade Act in the House of Representatives. Knife Owners’ Protection Act of 2018 (S. 3264) including Repeal of the Federal Switchblade Act Introduced in the Senate.